This fall and continuing into the winter months, Aramark Engineering Solutions will be work directly with the City Facilities Staff to retro-commission the heating systems in all of the city schools. Each week several technicians will review the operation of boiler, hot water pumps, and climate controls to insure that they function as designed, and operate efficiently, and meet the school energy codes for space conditions. 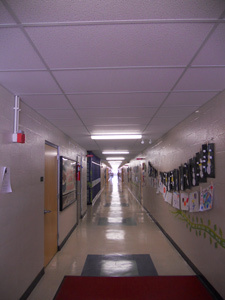 These projects consist of the replacement of the existing 32 watt fluorescent lamps and ballasts in the hallway fixtures, with new 25 watt fluorescent lamps and new high efficiency ballasts. Wireless Motion sensors are also being installed in both the hallways and rest rooms to de-energize the lights after a time delay when no people in the area are present. These projects combined are projected to decrease the cost energy consumption by $30,000 a year.